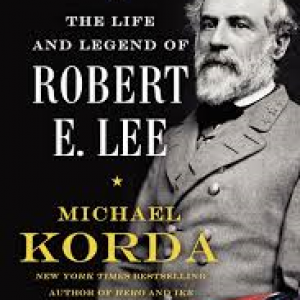 Devotees of Civil War biographies have been rewarded with two large works on Robert E. Lee in Michael Korda’s Clouds of Glory and S.C. Gwynne’s Rebel Yell: The Violence, Passion, and Redemption of Stonewall Jackson as the sesquicentennial observance of the conflict wound down. Lee’s life has been the subject of a number of earlier biographies, most noticeably Douglas Southall Freeman’s three volume Robert E. Lee: A Biography published in the mid-1930s with his sympathy for “The Lost Cause” shining through. Korda, whose earlier biographies on Dwight D. Eisenhower, T.E. Lawrence, and Lee’s last battlefield opponent Ulysses S. Grant, takes a harder look at the man and especially his command of the Army of Northern Virginia than did Freeman. “Lee was well aware he had failed. When he came to write his report on the [Seven Days] campaign [of 1862], he noted, ‘Under ordinary circumstances, the federal army should have been destroyed.”’ It was not. In fact at Malvern Hill, Lee’s “muddled and contradictory orders” led to the Confederate defeat there thus ensuring the escape of George B. McClellan’s Army of the Potomac. Korda’s greatest strength in Clouds of Glory comes through in his clear description of how a battle unfolded and the consequences of decisions, indecisions, mistakes, and luck. One of the best illustration of that clarity comes in his description of Second Manassas where Lee who usually held “the modest belief that it was his job only to bring his army to where it belongs and not to direct the battle itself” but instead here he took active control of the movement of his forces. He also brings into play the toll that the war took on Lee. “Great commanders are usually comparatively young men, while Lee was already fifty-five. He was almost certainly drawing on physical reserves he did not possess.” Winter after winter living in a tent with the survival of his Army and the Confederacy itself “must have subjected him to enormous strain, however carefully he concealed it” from before Chancellorsville to the end of the war. 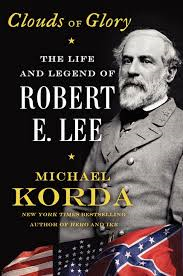 Korda’s Lee does not delude himself about Confederate chances after Jubal Early’s raid to the outskirts of Washington exhausted itself. “Yet, like most of the South, Lee fought on” until he concluded that his army could not. I have always been struck by Lee’s rejection of fighting a guerrilla war, even more so than his decision to side with Virginia after President Abraham Lincoln’s call for 75,000 volunteers to put down the rebellion after Fort Sumter surrendered. Through Korda’s words, Lee comes across as a man — not an icon, with a wife with her own mind on what she was supposed to do, when she was to do it, and where she would live and children that he worried constantly over. He tried with a great deal of success to pattern himself after George Washington [his wife was a Custis] and not his father “Light Horse Harry” Lee, who memorialized the first president but gambled recklessly on land and was jailed for his debts.